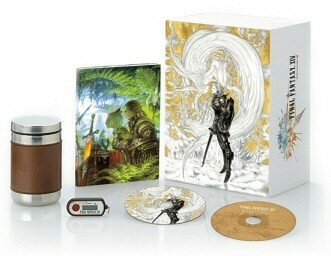 Collector's Edition: In-game items + physical items (including a dragon statue). Standard Edition: A cheaper version without the above perks. Combo Version: This includes FFXIV: ARR plus the expansion. There is also a downloadable version of the above, but the downloadable collector's edition does not come with the physical items. As such the price is lower. FFXIV: A Realm Reborn was released worldwide on PC and PS3 on August 27th 2013. Those pre-ordering the game and those who have obtained legacy status were eligible for an early access, which meant the game was playable a few days before the official launch date. The PS3 version will feature its own user interface designed specifically for a controller, though it is possible to use this on the PC too if you wish. At E3 2013 it was announced that FFXIV: ARR will be released on the PS4 and the date has been set for April 14th 2014. Players who own a copy of the PS3 version will be able to upgrade to the PS4 version for free. At some point in the future there will be a DirectX 11 upgrade for PC players. It has also been mentioned that there is a touch based user interface in the works designed for tablets and Windows 8 based devices. There is no need to buy this game if you already own a copy of 1.0 as you will be eligible for a free digital download copy of the game. If this is not the case then you are best off pre-ordering because this comes with bonuses. 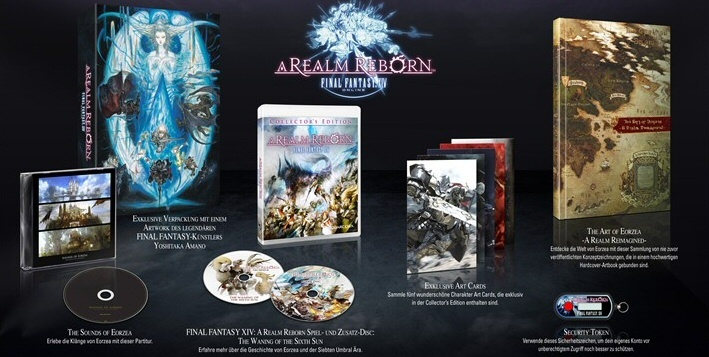 The bonuses you receive for pre-ordering FFXIV: A Realm Reborn are shown below. From left to right: Cait Sith minion, Mog Cap. The minion is a little pet that will follow you around. It's there for show mainly and will have no other purpose. There are many of these minions in the game and some will be rarer than others. There is also a minion for purchasing the collector's edition, which can be seen further down the page. From left to right: Special soundtrack featuring city and field music, Box art, Seventh Umbral Era Special Movie Disc, 5 piece art card set, art book, security token. As well as these there are also a number of digital items available. These items will be available to those who purchased the 1.0 Collector's Edition without having to purchase the new one. From left to right: Helm of light, Coeurl mount, Behemoth barding, Baby Behemoth minion. If you didn't know already then this game has more than just the chocobo mount in it. There's also the goobbue mount and a magitek mount in the works. With the collector's edition you get a coeurl mount. You also get some Behemoth barding (armor) for your chocobo. A baby Behemoth minion and Helm of Light are also bundled with this edition. The PS4 version will contain extra items; bringing with it the Fat Chocobo mount and Wind Up Moogle minion. Both of these items will also be available for players who own PC or PS3 collector's editions, almost certainly distributed via the in-game mailing system. FFXIV was released worldwide on the PC on September 30th 2010, with the PS3 version eventually being delayed indefinitely. The PS3 version of FFXIV v1.0 was never actually released in the end. People purchasing the PC collector's edition were able to play from September 22nd 2010. Players who received FFXIII campaign codes were able to obtain an item called Asuran Armguards, which improves the effectiveness of tools. it is going to be a great game, the bad thing about it, and many people will agree, is the monthly fee you have to pay, as an example, if you buy the game, $40, month entry, $15, monthly payment(depending on the offer you choose) $14-13-12. at the end of the month, you already spent almost $70 dollars, and then, you stil will have to pay between $13 and $15 dollars. so, you bassically will never end to pay for it, if you already bought the game for a console. The F.F developers should talk to Sony and the other companies where they are releasing the game and to decrease the monthy fee to half at least, due to all the payments a playstaion plus members have to do. They really need to think about that, not all the 1.8 million players in the different platforms have to pay other aspects on the game, like in order to play F.F Sony clients must have Playstation Plus. i hope they consider this as a real possibility of income for those who wish to buy the game for a console. What will happen to the Copy i have that i just bought from a store? If you pre-ordered from gamestop, the code to enter on early access site should be printed on your receipt from gamestop. If you pre-ordered before the release of these codes and it is not on your receipt, go back to game stop and ask them to reprint the code for you. They reprint it as a "lost code" or something of the sort, and I think the website you redeem that code on is already up and running (some difficulties) and you'll have you're early access code! Good luck. Did anyone who preordered this game get an email with their code in it yet, I preordered the game from gamestop and registered my email on the link they said to go to because they did not give me a leaflet with one on it in the store. i hope there would be a collectors digital download too in psn. I wanna to know, would this came out for PC. And is this game online just like other online game. Dear ff14, please please PLEASE release this game soon. I'm currently stuck playing the incredibly broken glitch fest that is DCUO and I'd much rather pay for something good. Sincerely, a loyal fan. I think the collectors edition listed here is the European one because I got everything listed/shown there. The US version was slightly different. I don't think it was worthless, the security token is still very useful and the other stuff is nice. I didn't get a mug. I got a leather bound mini book for taking notes with concept art watermarked on some of the pages. Just fyi. My collector's edition is worthless when eventually they can the whole thing and change the game a couple years later.